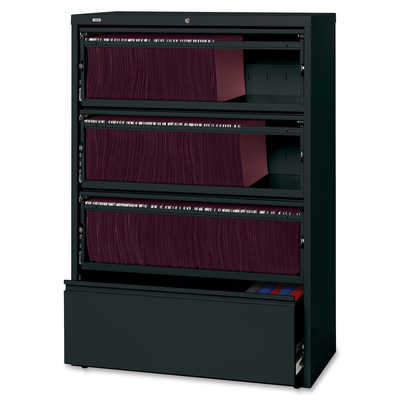 Receding Lateral File With Roll-Out Shelves Offers A Total Of Four Drawers With Heavy-Duty, Three-Piece, Ball-Bearing Slide Suspension For Smooth Drawer Movement. All Drawers Above The Bottom One Have Receding Fronts And Roll-Out Shelves For Easy Access To Your Files. Bottom Drawer Has A Fixed Front. Included Hangrails Accommodate Side-To-Side Filing Of Letter, Legal Or A4-Size Folders. Dual Lock Bars Secure Both Ends Of Drawers. Interlock System Prohibits The Extension Of More Than One Drawer At A Time. 36" Wide Lateral File Also Features A Core-Removable Lock. Full-Width Designer Drawer Pulls. Four Adjustable Leveling Guides For Stabilization And Reinforced Double-Base Construction. Lateral File Does Not Include Dividers. File Meets/Exceeds Applicable Ansi/Bifma Standards. More From The Manufacturer.